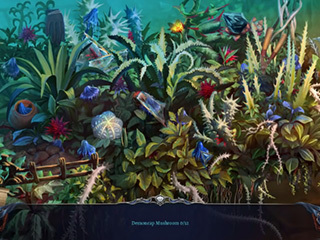 Here is another Collector's Edition for you hidden object puzzle adventure genre fans! 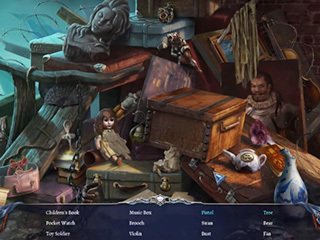 Grim Legends 3: The Dark City Collector's Edition is a great HOPA with a dark twisted story. Artifex Mundi did an excellent job with this game. The previous games in the series are worthy of your attention too if you have never played them! There is a bonus game, where you play as Sylvia's brother. You play as one of the acolytes of Order, Sylvia. Your job is going to be to hunt down one of your former members who allegedly stole an important artefact. This artefact is a crystal with great power, but also with a power to release an incredible monster, called Koshmaar. Well, the long story short, he did release him and now the whole town is overtaken by this dark power. As you deal with this, you will have to encounter some of the personal issues involved in the situation and learn something about your past. The story is interesting and intriguing keeping you awake. There is a bonus game, where you play as Sylvia's brother. Koshmaar is running free again, so you will have to conquer it all over again as a different character. The game is about the fight between good and evil and its graphics do reflect it. The gothic-style hand drawn scenes are perfect for the place overcome by a dark power. 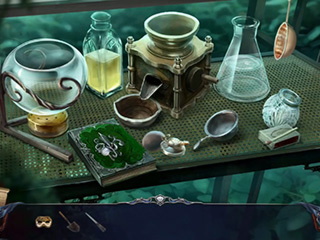 The game features four modes of difficulty: Casual, Advanced, Expert, Custom. If you don't want to get the penalty for random clicking, don't click randomly! And adjust the hints (2-240 seconds) and skips (10-120 seconds) according to your skills. You get a map and a strategy guide to navigate through the game. Sometimes you have to complete a puzzle to know what the next step should be. The game is much heavier on the mini-games side. Most of them are quite fascinating and innovative. They differ in type and difficulty level. Most of the game feels like a labyrinth and you need to find a way through it. The HOP scenes a rather few, but most of them are replayable just as most of the mini-games are. Then there are 30 collectibles and 28 achievements. The game keep you busy for a while and reward you will all kinds of media extras. This is Grim Legends 3: The Dark City review. Download this game here.